Grilled salmon (or any oily fish) served with the most colourful fresh salad and a homemade dressing incorporating your favourite flavours. 1. Heat grill to medium heat. Line a grill pan with foil. 2. Place the salmon or other fish fillet on the grill pan, squeeze the lemon juice over the salmon, drizzle with olive oil and place under the grill on medium heat. 3. Grill for approx 15 minutes or until cooked right the way through. 4. Once cooked, allow to cool until you can break it up gently into pieces. 5. Combine all the dressing ingredients in a small bowl and mix thoroughly. Season with salt and pepper to taste. 6. 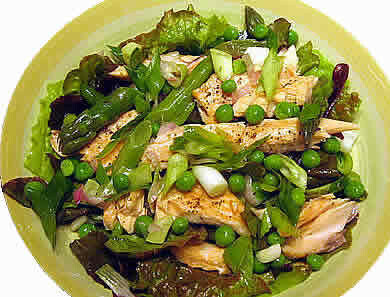 Combine the salad leaves, onions, peas, cucumber and asparagus in a bowl. 8. Transfer the dressed salad to a plate and top with the broken up pieces of salmon.